Not much is known about the sporangia of Trichopherophyton, the second-rarest higher plant in the Rhynie chert (Lower Devonian), distinguished by bristles on its upper parts. Apparently the plant is prone to rapid decay. 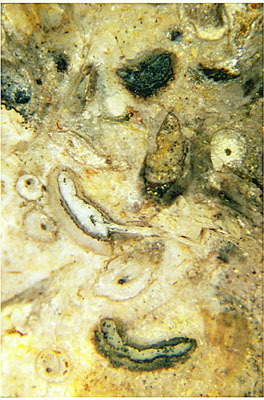 Hence, detached bristles and sporangia are often the only remains left in the chert. The original publication shows one comparatively well preserved axis fragment with two attached sporangia, however, "the spatial distribution of these reproductive organs in relation to each other and to the whole shoot system must remain a matter of uncertainty until more extensive and better preserved remains are discovered" . A small chert sample of 0.12kg found in 2002 is interesting in this connection as a cluster of 6 sporangia is seen on its raw surface. Subsequently prepared 4 cut and polished faces reveal poorly preserved axis sections with bristles but no more sporangia. Therefore, the clustering is certainly not incidental although an axis related to the 6 sporangia is not seen. It may be hidden behind, more or less decayed. The aspect of the cluster suggests that the sporangia are arranged not in single file but with a more variable orientation and irregular spacing. 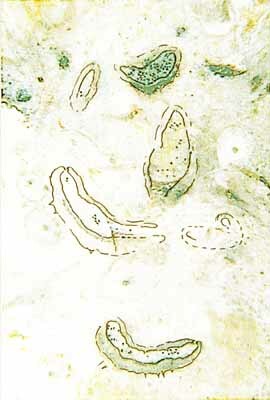 Photograph and drawing: Trichopherophyton sporangia on the raw surface of a small chert fragment, (contours outlined on the right): first evidence of their arrangement in irregular clusters. Height of the picture 11mm.